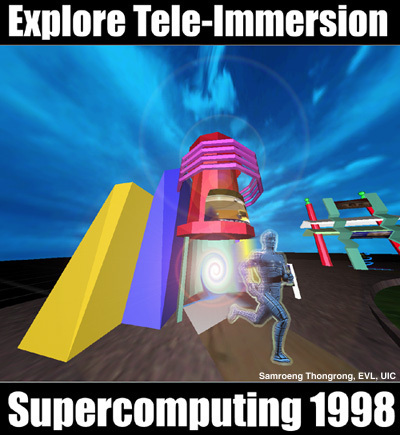 Booths at Supercomputing'98 (iGRID/STARTAP/TransPAC, Alliance, Argonne, NLANR) as well as research centers in Singapore, Australia and Tokyo will host virtual reality portals into a number of Tele-Immersion collaboratories at Supercomputing'98 in Orlando, Florida. These collaboratories will showcase a variety of applications developed with the CAVERNsoft Tele-Immersion system (a Globus application). A virtual atrium will serve as a central teleportation point into the various collaborative environments. Once in these environments, remote participants will be able to see each other as avatars (virtual representations of themselves), speak to each other through streaming audio, and interact with the world. From this web page you will be able to track the people who enter each of the worlds. a. CAVE6D - a collaborative visualization application for environmental hydrology. c. The Silk Road Cave Shrines- a collaborative tour of the Mogoa Grottoes of Dunhuang in China- an ancient historic site. e. The CAVE Collaborative Console- a set of tools for way-finding in Tele-Immersion. These tools will be used within an architectural space. f. FutureCamp'98- a number of collaborative worlds created by at a multidisciplinary, virtual reality, day-camp by 9-11th graders, to teach them concepts about modeling in 3D, and Oceanography. g. Image-based Three Dimensional Model Reconstruction- this application visualizes a chip manufacturing microscope laboratory at Argonne National Laboratory that was recreated using a new algorithm for image-based reconstruction. h. Heliac Plasma Coils- this application shows the main magnetic coil set and a magnetic "flux surface" of the H-1NF Heliac experiment which is an alternative to the tokamac style of fusion device. i. LIMBO/VTK- LIMBO/VTK combines LIMBO with the Visualization Toolkit to allow application developers to use the rich set of visualization tools built into VTK to generate sharable three-dimensional objects in LIMBO. All these applications will be instrumented so that bandwidth, latency and jitter of the underlying data paths can be measured through the entire duration of the conference. These measurements will be used to characterize data access in Tele-Immersion in order to inform our future research goals of providing networking quality of service for tele-immersive applications over significant distances and different time zones. The broader scope of Tele-Immersion research includes: database techniques for recording realtime collaborative sessions and for querying and accessing large data stores of scientific and engineering data; realtime graphics techniques and human-centered tools for synchronous and asynchronous collaboration; and networking techniques for ensuring quality of service and for striping of data for maximal utilization of high-bandwidth links. Additional information about the field of Tele-Immersion may be found at the WEB pages below. Maxine Brown, Tom Frisch, Andrew Johnson, Jason Leigh, Yalu Lin, Abhinav Kapoor, Kyoung Park, Maggie Rawlings, Nikita Sawant, Chris Scharver, Samroeng Thongrong.